When these expectations are added to the foundational responsibilities of building and operating basic IT infrastructure, the role of the CIO can become complex and rife with interruptions. As CIOs face more pressure to drive rapid scale, there is great temptation to bypass critical IT fundamentals. For example, outsourcing basic IT functions to a low-cost, offshore model may seem like a viable approach. However, businesses who do so typically struggle to regulate and maintain service quality, ultimately undermining their growth potential. Moreover, scaling through labor alone ultimately requires more and more labor, creating additional complexity for IT leaders to manage. So, how can CIOs develop an approach that helps them accomplish more while ensuring efficient scalability? One answer is Intelligent Automation. What is Intelligent Automation (IA)? 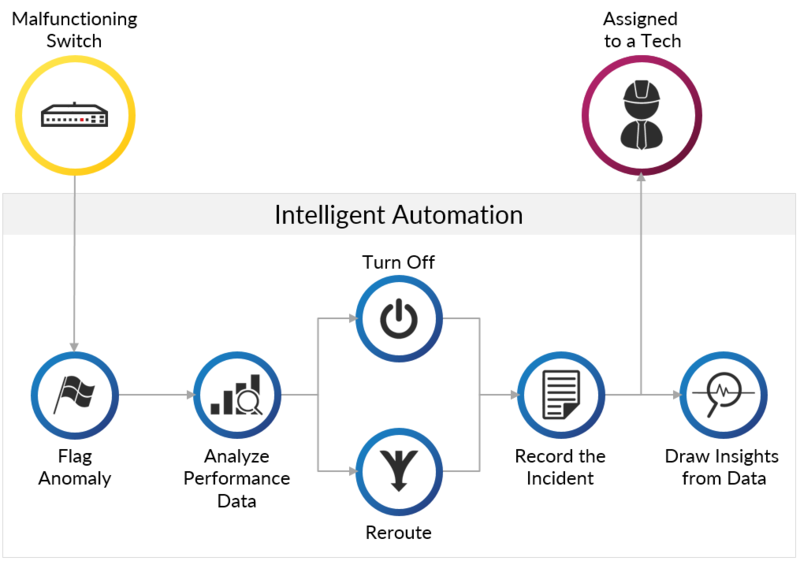 Intelligent Automation (IA) is a system that uses machines to interpret data, make decisions, and take action on those decisions. IA systems learn from both patterns and human guidance, going beyond the capabilities of scripted bots found in traditional automation. Rather, IA tools analyze incidents to independently seek out solutions and make predictive adjustments. IA is incredibly powerful in IT environments because of its ability to not only infinitely scale repeatable work, but to do so consistently and with high quality. To fully understand how IA differs from standard automation, let's follow the example of a malfunctioning network switch. In a traditional automation approach, this situation will be flagged and escalated to a technician for further troubleshooting and remediation. IA, on the other hand, will not only recognize the anomaly, but will analyze the performance data and decide on a specific remediation to address the issue. If the issue cannot be resolved through automation, the IA platform will only then escalate to a technician. The IA platform will not only record the incident, but it will shadow the resolution process to improve the outcome of possible future events. Also, if the issue is pervasive across the environment, it will study the aggregated data to draw insights about reoccurring problems so that the root cause can be addressed and resolved. Traditional automation, conversely, will simply continue to flag future incidents without a mechanism to develop better intelligence. How Does IA Contribute to Scalability? IA offers significant benefits when factored into the business’s overall IT strategy and approach. In fact, businesses leveraging IA can expect to experience increased efficiency, better performance, and reduced costs, all of which help improve IT operations and positively impact business outcomes. The real benefit of IA, however, is the ability to scale rapidly with high quality. By using IA to streamline mundane and time-consuming IT tasks, CIOs have the opportunity to reprioritize critical talent to more strategic work across the organization. And, by working smarter, businesses can expect to attain a higher-performing IT infrastructure that is capable of scaling efficiently. Valuable data: The starting point is good data generated by sound fundamental processes. With those in place, IA tools can gain a contextual understanding of different business environments by gathering information and identifying patterns. Knowledge base: It’s important to have a robust knowledge base about the IT environment through in-depth documentation of infrastructure and processes. This may require instituting proper governance for maintaining a current knowledge base of processes, such as change management, service updates, etc. Operational awareness: Before implementing IA, it’s important to be aware of bottlenecks and operational workflows. Through service blueprinting, CIOs can analyze service tickets and infrastructure failures to identify areas for service improvement and also record effective business processes to mirror when implementing IA. Process visibility: IA is most effective for reducing repeatable errors, especially when applied to large-volume processes and tasks that are repetitive in nature. By identifying “quick-fix” tasks, such as email authentication and password resets, IT leaders can maximize the effectiveness of their IA implementation. Likewise, by recognizing which processes are more error-prone, IT leaders can discern where automation can most likely mitigate the risk of error. When formulating a strategy that includes IA, it’s important to recognize that IA is not a like-for-like replacement for existing personnel and processes, but rather, an enhancement. IA alone is not an end-to-end IT solution and needs to be implemented and managed sensibly to reap its full benefits. When it comes to tackling such a challenge, IT leaders must juggle maintaining day-to-day businesses operations and delivering on digital transformation initiatives with devoting the time necessary to achieve a successful outcome with IA. Experience scaling up: An automation project that can’t scale up turns into an expensive experiment; thus enterprises need a partner that understands how to scale. Digital transformation puts inevitable stress on IT infrastructures, and businesses can’t afford to fall behind from either a financial or scheduling perspective. Pragmatic approach to ITSM maturity: Effective IA implementations focus on data and process first, and only then apply tools to address specific requirements. It’s critical that CIOs seamlessly translate IT projects into business initiatives, so having a sound approach to ITSM is crucial. Technology insight: To drive business value, enterprises need a carefully selected, comprehensive toolset that leverages existing investments but also drives consolidation and automation over time. Trying to integrate too many “best of breed” solutions at one time is extremely difficult, and smart MSPs know that it's best to start with a comprehensive, extensible platform. Flexibility and honesty: The relationship between enterprises and MSPs needs to be agile and collaborative so that both sides are learning, growing, and aligned with business goals. One-sided relationships, or those based on rigid, contractual rules, tend to break down over time, resulting in a less-than-stellar outcome. Continual service improvement: Effective MSPs ensure long-term success by using data to make strategic decisions that consistently improve performance. Continual service improvement is a crucial component of any IT strategy and is a key ingredient required to derive sustainable value from IA tools. By increasing efficiency, improving availability, enhancing performance, and reducing costs, IA offers businesses the tangible benefit of rapid scale, but only with the proper strategic approach and expertise.